Mary Adshead was an English painter, muralist, illustrator and designer. 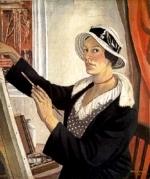 Working with her husband, she illustrated two children’s books. Two years after their adventures with the magic bed-knob, Carey, Charles and Paul return to spend the summer with Miss Price - and the magic begins.